It’s a hat, that’s also a compass.Â There are LEDs in the brim – whichever is pointed North is the one that’s on.Â I’m planning on adding a “party mode” which just lights them up in various patterns, but haven’t gotten around to it yet. Did I mention that they are pink LEDs? 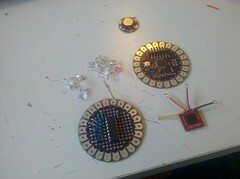 Anyone else working on fun knitted things, wearable computing projects, or knitted electronics? This is also an open thread, for discussion of subjects of general interest, things in older posts, and things we’ve never posted about. This entry was posted in Uncategorized and tagged Hardware, hardware hacking, open thread on 2010/08/08 by Leigh Honeywell. I’m so showing this to my hack group – they want to have a session of nothing but knitting, and I’ll totally get them to make something like this! Yes! Kinda on the back-burner though. I made a 7×7 LED-matrix top a while back (http://chebe.dreamwidth.org/17644.html), and am working on adding a IR-receptor so that the patterns can be remotely changed, a bit like laser-tag. Also, working on taking input from lots of accelerometers and reading it into a 3D program for animating 3D-models. Still fairly new to all this (about a year), but loving it! …wow, a whole new world of possibilities has opened up for me! (I sew.) So purrrrdy and clever! Sorry, got all excited I forgot my manners! I’ve heard a couple of other people talking about projects like this, but this is the most fun one I’ve seen! Also, I like the leads you added to the compass component, I haven’t come across them before, quite ingenious. Did you knit the hat yourself as well? I never got the hang of knitting in school, but it’s next on my to-learn list. Thanks! I wasn’t sure if the compass leads would work, but they were fine – the conductive thread seems to make good contact with the wires. I didn’t knit the hat myself, my partner got it for me at a folk festival from Whidbey Woolies. 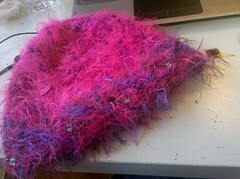 That thing… is very possibly the most strange and wonderful and fabulous thing in the whole history of hats. North? Have you been playing Echo Bazaar? Ah! AWESOME Leigh! I’ve always wanted to play with electronickery, and you’ve just given me an extra kick to do it! Looking at your code now!! Me: am not currently knitting, am doing other crafty things. Going off to pick wild cotton and pick up sea glass today. Have been picking seeds out of the cotton (takes forever, need to build a gin), as I want to colour it with local dyes and spin it, and then… knit/crochet it into… I need to think of something really awesome! Here’s something interesting: it appears a group of conservatives have been conspiring to bury articles on Digg that don’t match their viewpoints and silence liberal posters. Which, of course, implies something else: the prevalence of conservative viewpoints on Digg and the lack of, for example, feminist or anti-racist stuff says les about Digg users than it does about how easily a small group of unethical people can control what’s on the site. This kind of organized burying has been going on for a while at digg. In early 2009, I worked with Jen Nedeau, Tracy Viselli, Steve Elliot, and several others to get progressives, feminists, and anti-racists to leverage Twitter for a counter-strategy. Alas things petered out after my digg account got suspended. Of course progressives have mailing lists and sites where they organize their digging as well. However in my experience progressives tend not to go for organized burying the way libertarians and conservatives do. There are organized bury gangs all over Digg. Digg ceased being relevant or useful in April 2009. Before then, you could post a story and it would rise or fall on its merits. You could build up a network of fellow Diggers to “shout” to, notifying them when you had posted a new story, and then they would Digg it. Depending on the category, all you needed was 30-50 Diggs to lift a story above the spam and other noise, and then if it was interesting and relevant to other people, it would get some good traffic. Having giant organized Digg gangs doesn’t make a story successful, because you want readers clicking on the link and reading your story, not just Digging it. Skillions of Diggs are worthless if people aren’t actually reading your story. Then in April 2009 something changed, and overnight the organized Bury gangs had all the power. It takes only a few Buries to kill a story, and there are organized troll gangs who exist solely to kill stories. Many people have tried to get Digg to enforce their own policies and do something about this, but they refuse. It’s hard to imagine what benefit Digg gets from this, and I’m thinking there isn’t any because they are in financial trouble. 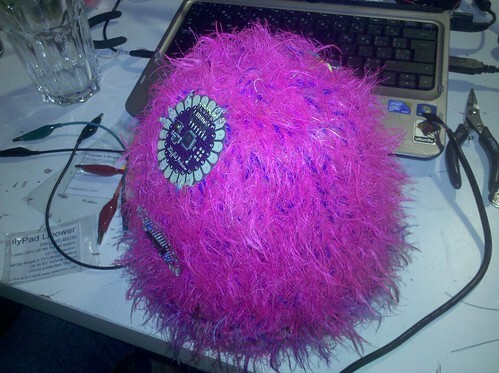 It’s just amazing what you can do with yarn and a few components. And the conductive yarn? So cool! This amused me to no end. I thought you guys might find this worth writing about: http://popcultref.wordpress.com/2010/08/07/xbox-fail/.